The shinkansen high-speed trains are the fastest way to discover all of Japan, reaching a speed of 320 km/h (199 mph). The Japan Railways (JR) network, which can be accessed by the Japan Rail Pass, practically covers all the country, with the addition of the new Hokkaido Shinkansen, and the popular Tokaido Shinkansen. The nine Shinkansen lines take you in different directions around Japan. Two of them, the Kyushu and the Tokaido Shinkansen lines, go south from Tokyo. The Sanyo Shinkansen line also runs south but departs from Shin-Osaka. The other six lines either take you north or inland from Tokyo. These are the Akita, Hokuriku, Joetsu, Tohoku, Yamagata Shinkansen lines. Finally, the Hokkaido line takes you the furthest north, all the way to Hokkaido island. Please check each line for more information. The Japan Rail Pass gives you unlimited access to all Shinkansen bullet trains except the two types of express trains: the Nozomi and the Mizuho, which run on the Tokaido, Sanyo, and Kyushu Shinkansen lines. If you need to use these two types of express trains, the Japan Rail Pass does allow you to make a free reservation, but you need to pay the main fee. The Hikari, Kodama, and Sakura bullet trains are the fastest trains you can board using the Japan Rail Pass, they make just a few more stops than the express trains. There are different types of trains which run on each of the Shinkansen lines. There are express trains which are the fastest, semi express trains, and local trains. For instance, on the Tokaido Shinkansen line, which links Tokyo to Osaka, the express train makes six stops, the semi express makes between seven and 12, and local trains stop at all 17. For more information, see the route maps below. The Japan Rail Pass does not include the express trains, though it does allow you to make a free reservation. The express trains only operate on three of the lines, the Tokaido, Sanyo, and Kyushu Shinkansen lines. Semi express and local trains run on all nine of the Shinkansen lines. The Akita Shinkansen is a branch line, part of the Tohoku Shinkansen line, which connects Tokyo with Aomori. Komachi is the single existing train category on the Akita line. It is an E6 series, also known as Super Komachi. All seats on the Komachi train services are reserved. Smoking is forbidden. The Komachi train services are operated by E6 series with 7-coach train sets. There is a direct train service from Tokyo to Akita, taking you there in exactly 237 minutes. The Komachi train can run at a maximum speed of 320 km/h (200 mph) on the Tohoku line. Between Tokyo and Morioka, the Komachi trains are coupled with Hayabusa, forming a 17-car train. Komachi runs on its own between Morioka and Akita and forms a 7-car train set. A seat reservation for these trains is mandatory, as there are no non-reserved seats on board. In the case that all seats are booked, standing reservations can still be made. The Hokkaido Shinkansen line connects Aomori, located on Japan’s main island - Honshu with Hakodate, located on the Hokkaido island, via the Seikan Tunnel. There is a scheduled extension of the Hokkaido Shinkansen line. In 2030 passengers will be able to reach Sapporo. Two trains are currently operating on the Hokkaido line: Hayabusa and Hayate. Read more about the Hokkaido Shinkansen in our blog. The majority of Hokkaido Shinkansen trains are Hayabusa. They operate between Tokyo and Hakodate with a speed of 320 km/h (200 mph). The journey from Tokyo to Hakodate takes approximately 280 minutes. The Shinkansen Hayabusa goes all the way to Shin-Hakodate-Hokuto, a station located between the cities of Hakodate and Hokuto. Once there, you will need to take the local Hakodate Liner for just 19 minutes to reach the city of Hakodate. It is mandatory to reserve your seats, before boarding the Hayabusa train as there are no non-reserved seating areas. If all reserved seats have been sold out, standing tickets will be available. A few of the trains on the Hokkaido Shinkansen line are Hayate. They usually operate during the morning and late evening, between Hakodate and Shin-Aomori, as well as Morioka. It is obligatory to book your seat before boarding the Hayate train. There are no non-reserved cars. If all reserved seats have already been booked, standing tickets will be made available. The Joetsu Shinkansen line dates back to 1982, connecting travelers from Tokyo with the hot spring and leisure resorts in Niigata and its surroundings. Toki and Tanigawa are the two train categories that operate on the Joetsu Shinkansen line. The Toki trains offer a diversity of models, including two-story train sets called Max Toki. The operating speed of the train is 240 km/h (150 mph). The Shinkansen Toki will take you from Tokyo to Niigata just over an hour and a half. You are not required to make a seat reservation in advance when boarding the Shinkansen Toki. All trains of this category offer reserved, non-reserved, as well as Green Class seats. This is the slower of the two train categories, operating on this line (Toki and Tanigawa). This is because Shinkansen Tanigawa stops at all train stations between Tokyo and Echigo-Yuzawa. During the winter season, the train reaches Gala-Yuzawa, getting travelers to the nearby ski resort. The operating speed of the train is 240 km/h (150 mph). Shinkansen Tanigawa will take you from Tokyo to Echigo-Yuzawa in a little over an hour. You are not required to make a seat reservation on the Shinkansen Tanigawa trains before boarding. Similar to the Toki train, which also operates on this line, there are both reserved and non-reserved seating areas on Tanigawa. There are three train categories that operate on the Kyushu Shinkansen line: Tsubame, Sakura andMuziho. The Tsubame and Sakura trains are covered by the Japan Rail Pass. Muziho trains are not part of the JR Group. Tsubame is the slowest of the trains operating on the Kyushu Shinkansen line, since it is stopping at all stations until it reaches its final destination. It is also the smallest train of this category. There are no Green Car seats on this train category. The operating speed of Tsubame trains is 260 km/h (160 mph). A trip from Kagoshima-Chuo to Hakata with the Tsubame train will take you a little over an hour. It is not required to make a seat reservation before boarding the Tsubame train. There are both reserved and non-reserved seating areas. There are no Green Cars on this train category. The Sakura train is the second fastest train on the Kyushu line, serving fewer train stations than Shinkansen Tsubame. There are two different types of Sakura trains: one 8-coach and another 6-coach train set. The larger one offers both Standard and Green Class cars, while the smaller one only has Standard cars. The operating speed is 300 km/h (185 mph). It will take you approximately an hour and a half to reach Hakata from Kagoshima-Chuo station. The Sakura trains have both reserved and non-reserved seating areas. This means that you can make a seat reservation before boarding, if you wish. However, it is not obligatory. The Hokuriku Shinkansen line was opened in 1997 for the Nagano Olympic Games. Ever since the line has developed even further and you can now use it to go from Tokyo to Kanazawa (extended in 2015). Before the line was extended, it was commonly known as Nagano line. There are four train categories that operate the Hokuriku line: Kagayaki, Asama, Hakutaka, Tsurugi. The Kagayaki train is the fastest on the Hokuriku Shinkansen line. It has only two stops between Tokyo and Kanazawa. The overall journey will take you less than two and a half hours from Tokyo to the final destination - Kanazawa. The train operates with 260 km/h (160mph). 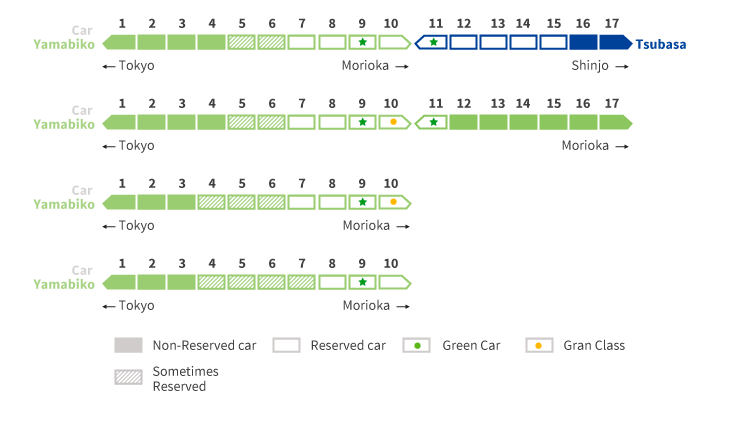 The Kagayaki train has 12 cars, 2 of which are extra special: a Green Class and a Gran Class cars. Kagayaki is one of the few train categories that require making a seat reservation before boarding. There are no non-reserved seating areas on this train. In case all seats have been booked, standing tickets will be made available. The name Asama comes from the name of an active volcano on Mount Asama, located near Karuizawa. Two train types are operating the Asama train services: 8-coach and 12-coach train sets. Both are non-smoking trains with reserved and non-reserved seating space, Green Cars, and wheelchair space. You are not required to make a seat reservation, before boarding the train. The Asama train offers reserved and non-reserved seating areas. The Hakutaka and Kagayaki trains are the only two on the Hokuriku Shinkansen line that run from Tokyo, all the way to Kanazawa. Hakutaka is the slower of the two trains, since it makes more stops on the way to its final destination. The operating speed of Hakutaka is 260 km/h (160 mph). A trip from Tokyo to Kanazawa will take less than three hours. There are both reserved and non-reserved seating areas on the Hakutaka train. You are not required to make a seat reservation before boarding. The Tsurugi train serves as the main connection for locals between Toyama and Kanazawa. The service was first introduced in 1961 and included a sleeping car. After many line reformations, the Tsurugi uses 12-coach trains, 3 of which are not in use currently. 1 of the 12 cars is Green Car (first class). The Tsurugi train has both reserved and non-reserved cars. This means you are not required to make a seat reservation before boarding the train. The Sanyo Shinkansen line connects the city of Osaka with Fukuoka on the island of Kyushu. This is the second oldest Japanese Shinkansen line. It was built and completed in the early 1975. Now there are five train categories that run on this line: Nozomi, Hikari, Kodama, Mizuho, and Sakura. The fastest train is Nozomi and it develops an operating speed of 300km/h (185mph). The Nozomi and Mizuho trains do not form part of the national JR Group, as these are private lines. Hikari is the fastest train service on the Sanyo and Tokaido Shinkansen lines, covered by the JR Group. Hikari services now operate with 8-coach and 16-coach train sets. 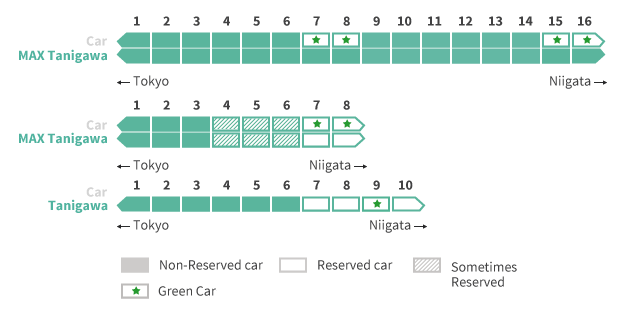 There are three Green Car compartments on the 16-coach Hikari train. Most of the 8-coach trains have been replaced by Sakura train services as of 2012. The operating speed of the Hikari train is 300km/h (185mph). It takes a little over an hour to reach Okaya from Shin-Osaka. There are both reserved and non-reserved seating areas on the Hikari train. No seat reservation is required before boarding. This is the slowest train service on the Sanyo line, as it stops at all train stops until it reaches its final destination. Because of this, Kodama takes close to five hours to arrive at Hakata station from Osaka. The train service uses 8-coach sets, none of which include a Green Car. There are both reserved and non-reserved seating areas on the Kodama train service. The operating speed of the Kodama train is 300km/h (185mph). You are not required to book a seat before boarding the train. There are both reserved and non-reserved cars. This is one of the fastest train services operating on the Sanyo Shinkansen line. It’s operating speed is 300km/h (185mph), similar to the other trains on the same line. However, the Sakura trains makes fewer stops on its way to Hakata Stations, thus arriving faster. It operates with 8-coach train sets, both reserved and non-reserved. There are also Green Cars seats, however they make up only half of car number 6. There are both reserved and non-reserved seating areas on the Sakura trani. You are not required to make a seat reservation, before boarding. The Tohoku Shinkansen line is the line that connects Tokyo with Aomori. There are two branch lines - Akita and Yamagata Shinkansen lines, which connect the Tohoku line with the prefectures, they are called after. There are six different train categories, which run on the Tohoku line: Hayabusa, Komachi, Hayate, Yamabiko, Nasuno, Tsubasa. Hayabusa is the fastest train in Japan, reaching a maximum speed of 320 km/h (200 mph). There is a direct train that connects Tokyo to Shin-Aomori in just 189 minutes. Making a seat reservation before boarding the Hayabusa train is mandatory. There are no non-reserved cars on this train. In the event that all seats have been already booked, standing tickets will be made available. Following is a graphic of the train cars and facilities. Yamabiko Shinkansen is a high-speed Shinkansen, operating with a speed of 240 km/h (150 mph). It connects Tokyo with Morioka. There is a direct train service that will take you to Morioka in exactly 198 minutes. All of the Yamabiko trains offer both reserved and non-reserved seating areas. Similar to most JR trains, this is a non-smoking one. The Hayate trains connect Tokyo with Morioka. What distinguishes this train category from Yamabiko is that it doesn’t stop between Sendai and Omiya. Hayate train’s operating speed is 275 km/h (170 mph). It will take you from Tokyo to Morioka in approximately two hours. It is obligatory to make a seat reservation, before boarding the Hayate train. There are no non-reserved seating areas. In the event that all seats have been already booked, standing tickets will be available. Tokaido Shinkansen is Japan’s busiest line and most popular one, as it connects the three biggest metropolitan areas of the country: Tokyo to Yokohama; Osaka to Kyoto; Nagoya. It is also famous for being Japan’s first high-speed railway, which opened in early 1964 for the Japan Olympic Games. Three categories of trains operate on this line: Nozomi, Hikari, and Kodama. The Japan Rail Pass does not cover the Nozomi bullet train, as this is a private line, not part of the national Japan Rail Group. The Hikari train connects Tokyo to Shin-Osaka in exactly 173 minutes. The maximum operating speed is 270 km/h (168 mph), which makes it the second fastest train on the Tokaido line. Hikari also runs on the Sanyo Shinkansen line with an operating speed of 300 km/h (186 mph). All Hikari trains have both reserved and non-reserved seating areas. If you wish to book a specific seat, you can do so at any ticket office, at any rail station in Japan. Kodama is the slowest of the three train categories that run on the Tokaido Shinkansen line. This is due to the number of stops, which is considerably larger, in comparison to the other two bullet trains on this line. By stopping at all stops of the Tokaido line, the Kodama train takes close to four hours to reach Shin-Osaka. It operates with a speed of 285 km/h (175 mph). Kodama trains offer both reserved and non-reserved seating areas. Similar to the other trains, smoking on board is forbidden. Yamagata Shinkansen is a Tohoku Shinkansen branch line. Tsubasa is the only category of trains that run on the Yamagata line between Tokyo and Shinjo. Tsubasa services are operated by seven-car E3 series. 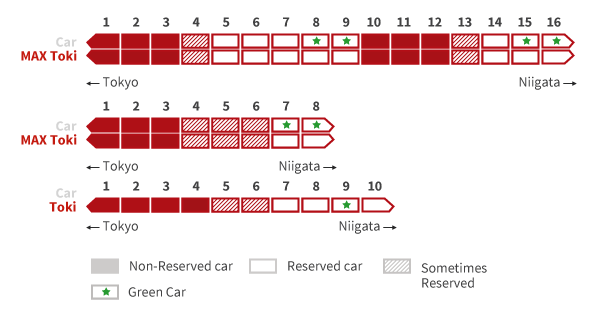 There are both reserved and non-reserved seat cars on the Tsubasa trains. If you wish to reserve your seats, please go to any ticket office before boarding the train. Passengers are allowed to have their bike with them on board, for no additional fee. However, it is required that the bicycle is folded or disassembled and packed. Small pets such as cats, dogs or birds are allowed on board, as long as they weight less than 10kg and are safely put into a container, with a maximum length and height of 90 cm. Travellers are allowed luggage on board for no additional cost. However, there is a limitation of two pieces of luggage, both of which should have a maximum weight of 60kg and a total of 250 cm in height, length and width. There is a delivery service option. The bullet trains are very easy to access for passengers in wheelchairs and mothers with strollers. If you wish to book a special seating, if inwheelchair, you may do this free of charge. The only requirement is that you make this request at the train station, where you will be boarding, two days in advance. Please take note of the maximum sizes allowed on board, as you must comply with the set regulations. The stations are well equipped and the elevators and escalators will help to ease your station access. Strollers are also allowed on board free of charge. The only requirement is for them to be folded and safely placed in the designated places. Don't forget to check all the extra advantages included with the Green Pass (First Class ticket).